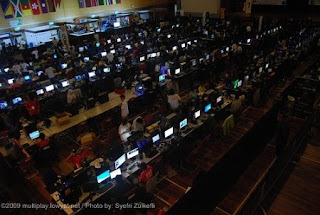 On the 12th of April 2009,371 gamers made history as they played their way into the record books.From the 11th of April,the gamers participated in a 40 hour non-stop LAN part,shattering the previous world record by 4 hours and 71 participants.They had Cyberview Sdn. Bhd., GameGen, and Multimedia Development Corporation to thank for organising this event,and also the Game Developer's Club of Multimedia University for the acquiring of the venue.Entry was free and all the participants had to do were bring their own CPUs and computer accesories. At the strike of noon on the 11th,the record clock started as the hall shook with the sounds of gunfire,exploding grenades,cheers,jeers and furious tapping of the keyboards.This continued until 2pm the next day.Euphoria swept the hall as everyone was delighted to have been a part of something special.Said Tristan Toh who was not there,"Of course I'm happy!At least we made a record that rivalled the Americans,instead of stupid ones like world's biggest ketupat and world's longest satay line. "Although the event was partly organised to showcase AMD's next generation hardware,it did not cloud the overall atmosphere and infectious mood generated by the bodies of over 300 sweaty and fatigued bodies.Here's hoping that the world record would be a good enough excuse when explaining to the boss/wife/girlfriend the reason for being unavailable for 3 days.